Merry Christmas TM! Thanks for many years of great blogging! Back from the in-laws. Lots and lots of good food, lots of kids, and smiling faces, and stories and laughs!!! I got a RAMONES T-SHIRT!!! I haven't been around much recently, so I don't know if LeBron (I think that is translated THE BRON) James, JEWISH MONEY comment has been discussed. I am NOT a fan of The Bron James, but I do recognize how unbelievably great his man is. He is clearly one of top 4 or 5 players to ever walk the earth. He's a basketball star, and a endorsement gold mine. I GOOOLAGED and BINGED news stories about JAME'S Jewish money comment, and it's a pathetic MFM LIBTARD FULL COMMIE.......errrrrr....WHITE WASH. It's not as clever as David ickes having lizard people rule the world, endorsed by Alice walker. Those were the days TM, pardons and all. Slightly longer than Just One Minute. That is sweet and tasty and clean as a whistle! Outstanding, Sir. Love it. Tying in VDH's nostalgic look at Christmas in the late 50's early 60's along with Christmas music, I was just listening to The Beach Boys doing an old Christmas favorite from 1963, Little Saint Nick. Little Saint Nick" is a holiday-themed hot rod song about Santa Claus and his sleigh, written by Brian Wilson and Mike Love of the American rock band the Beach Boys. The song was first released as a single on December 9, 1963, and peaked at number 3 on Billboard magazine's special seasonal weekly Christmas Singles chart. Its B-side was an a cappella version of "The Lord's Prayer"
What? A pop group in 63' putting out an a cappella version of The Lord's Prayer? Holy Moly, how unexpected! Anyhow, it's supposedly based on some musical version some guy wrote in 1935. After 2 listens it's not going to become one of my favorites, but interesting to find out what Capital Records thought might sell to teens in 1963. If any Pop group has recorded it in America since 1963 I'd be shocked. Daddy, I'm sure you remember SISTER JANET MEAD. This was before RICH half black washed up Pro Football players KNELT, not before GOD, but in protest of the COUNTRY that gave them EVERYTHING. Merry Christmas TM and all JOM. My favorite Christmas song is Oh Come Emmanuel but this one is an interesting updated version. And check out boris' video. It is great! Boris, that is TASTY. And the PRS sounds so JAZZY. It is spectacular. It gave me a chill for sure. Gentlejim, God bless you. Stay safe, and lets create a JOM meet/meat up for 2019. We could partner with CHI-TOWN and Henry, but wouldn't it be great to have a MAJOR get together in Indy, with Pin, and Miss Marple, hopefully Daddy Bradshaw, Buckeye, Capn'H. CHI-TOWN, Henry, GUS, Catsmeat, and several others. It would be awesome. Thank you. A mass JOM meet up would be fantastic. Indeed it would be Gentlejim. Feling maudlin on Christmas Eve. Merry Xmas to all. Listening and watching videos for my dear, departed, friend Emily Remler (1957-90). This may not be her best work, but it's the only video of her that I can find that's live so you can see her play. As I leave, I want to show my DISGUST at OBAMA bugging out of IRAQ. This is EXACTLY THE SAME as TRUMP, taking our 2000 MILITARY ADVISORS out of SYRIA. "According to Businessweek, the United States has 8,000 military personnel and 5,000 contractors remaining in Iraq, all of whom are set to depart. There were approximately 300,000 Americans in the country in 2007, nearly half of whom were contractors." "Though its troops are leaving the country, the United States has its largest embassy in the world in Baghdad, with more than 15,000 people stationed there - an issue the two leaders were asked about Monday." Versus 2,000 troops in Syria, who might have included the almost 500 US Marines manning artillery who have already withdrawn. So if we're removing 1,500-2,000 "advisors" maybe they have already trained up their counterparts. We've said we won't have boots on the ground in Syria. I don't remember anything said about air power. If the SDF has trained combat air controllers we don't need US Air Force controllers. If we don't plan to use air power, maybe the GCC forces do and trust the new SDF controllers. Merry Christmas, have snow turning into rain later. An unexpected white Christmas to start off. The cat decided to wish me an especially early Christmas greeting, so I’m up for the day now. I don’t think it’s as merry a day for the animal (can’t tell what kind) across the hall that has been crying for the last 30 minutes, though. Going to be a spectacular day. "Gus, The two are not similar"
Yes, Gus was being sarcastic. Thanks for the detailed stats, jim_nj. In the meantime, TheTrumpWall continues to chug along. As OL (et al) pointed out early $1B is a VERY large number. Realistically, it's not an achievable goal. So it's always been, as pointed out early by clarice, about HOW MANY Deplorables chose this as a vehicle to show support for the policy and for PDJT as a leader. Facebook Tweet 959k shares-- this number hasn't budged for days and days. Either a bug, or it is pegged at the max value that GFM can display. The 277K number is notable. The count continues to grow. It passed a quarter million. And just kept rising. Will the gains slow now? Will we top out at 300K? Will clarice, Deplorable Don Surber, PowerLine Insty, ... publicize it further? Will pledgers convince friends and family members to join? Time will tell. Cold (well, for us--below 32) and dry. Sunny all day. High of 52 at 4pm. Merry Christmas to all my JOM peeps. Could not sleep: too many visions of sugar plums: maybe all the glasses of wine had something to do with it??? Jim nj, I spend the entire month with dead people dancing in my head. I have so many memories that get triggered--going through my address book, hearing songs and carols, even out of nowhere-- which involve dead relatives, family friends, and now my neighbors and contemporaries who have moved on. I even found a four year old funeral program of my senior partner in my cookie press box when I opened it yesterday! It doesn't make me too sad though, generally grateful to have had so much love in my (amazingly untouched by suffering or premature loss*) life. I do find myself tearing up some though, like last night at the crazy Christmas Mass my parish hosts in the school cafeteria for overflow from the one up in the church at the same time (that has every child in the parish under five and their families and visitors milling about---a real bus-station-in-New-Delhi vibe, which I love). We sang Silent Night after communion, and I was five years old again, sitting next to my daddy (dead four years now, virtually long before that w treatment refractory depression) with my aunt on his other side at St. Luke's one winter night, with my older cousins singing in the choir. Upside of older children--last night when we realized we still had wrapping to do, we all decided we'd wrap in the morning, open gifts later. Maybe like Saturday when the straggler gets here. To everything there is a season...and even subseasons. Speaking of subseasons---as our two decades long annual Christmas Eve gathering of six families didn't happen for the second consecutive year--half have moved; the other half is off with their children, who have left town--we watched James Corden's Car Karoke YouTube videos. His rides with Adelle, Paul McCartney, Michael Bouble. Elton John. Oh, Gwen Stefani too. That was quite different--but they are sweet and touching and joy filled in their own way. * I am well aware of my perhaps unique experience of growing up in the late 50s/early 60s in the city with the highest median income in the state, surrounded by extended family, taught by caring nuns. Merry Christmas to all in case you missed my earlier one. Jim,Sunnyvale; I have figured out a way to check if my regrisation (can't spell) went thru. Do you know How? a'mom - Reminiscing of a life filled with love and cherished memories? That sounds like a blessed life, indeed. Wishing all of the JOM family a wonderful Christmas. May we all experience the love of family and friends on this most special of days. Emily was a fine guitarist. I saw her live sometime in the 70s, but can't remember where. Curious how you knew her. Was she a local gal? boris - Congratulations. What a beautiful piece of music. And the PRS is pretty sweet, too. Not only did I know Cap Weinberger, but I spent many a project risk assessment meeting with him. He was at the old firm the same time George Schultz was our President. True story: When Cap was asked to come back to DC, and work for Reagan, the old firm's Legal Department to a man & woman, left work, went down to the bars around the financial center in SF, got drunk, partied and came in late the next day with headaches and smiles. He was loathed by everyone who worked for him. That was some very sweet music. Are you a professional musician? Merry Christmas JOM and so many thanks for the memories, the news. and the sound advice and comfort. What a crazy time we live in, such a great time to be alive. That was a sweet gift, Boris. Merry Christmas to you, JOMmers. Thinking of Christmas memories, way back in the 1960's the entire town of New Canaan, CT would meet at what was called "God's Little Acre"(It was bordered by three churches)to sing Christmas carols. As you can see by the short video below, the tradition is still going strong. So spacey is being tried in your neck of the woods old lurker? The little chord thingy @ around 1:00 was cool, Boris. You sure play clean. Nice job. Managed to play in bands since high school but never pro. Current trio has a few studio cuts and will try to put a few of them up sometime soon. We play the occasional charity or party gig. The keyboard player also plays banjo in a Madison bluegrass group. For the record ... the audio I recorded with the video was okay but as intended I substituted a carefully recorded version from last week. Fritz Updike died more than 20 years ago in his 90s. He knew all six generations of my family at the newspaper, starting work in 1926. This is his reflection growing up nearby. I love it. We run it every year: Christmas on Potato Hill. Didn't notice the difference, thanks boris. Bravo Boris! I had saved another of your songs a while back but spilled a coffee on my hard drive and fried it. I put this one on a thumb drive with all my grandchildren's cell phone pics. It's a beautiful song. It takes a special guy to do what you do Matt and after reading your posts out here I'm sure you've changed a few lives...God Bless You. Beasts - Merry Christmas ! Nice to see you back. Does this portend more frequent appearances (hint, hint) ? Yes, anonamom, holidays remind me, too, of those I loved who have passed on. As we age, it's also true, that even the living now tend to move or be otherwise absent as they are with far away children. One can view this with sadness or take joy in the blessing of remembering times and people past. A detailed account of the anxiety and suffering due to gov't shutdown. The effects of the government shutdown have gone from bad to worse. Last night was eerily silent. Not a creature was stirring, not even a mouse. I would like to add my appreciation to TM for this wonderful site. The many friends known only from the JOM site are such an important part of the Merry Christmas feelings we enjoy. 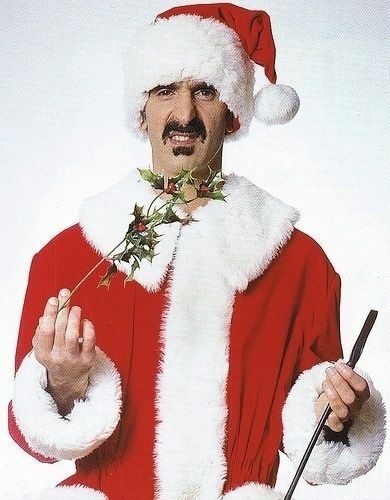 Merry 🎄 Christmas! Christmas tradition since my childhood is to attend Christmas Eve service, on the way home drive around and look at Christmas lights and then go home to open presents. Will attend Christmas service this morning. Merry Christmas to all! Thanks to TM for the site, and to all you regular posters. We who (mostly) lurk are always here in spirit. Terrific stuff, Boris! Very nice gift. pagar, I do not know how to check my registration. Belated condolences about Blue, Matt. Has anyone heard from Cecil? I haven't seen him here in so long? JMH? Miss her, too. Well that's fake news. It was on Christmas eve after all. Melania must have sneaked back into town. She and the President were photographed at the midnight service at the National Cathedral. sbw--thank you for the 9:54. My dad is rarely feeding himself except for sweets and my mom relies on ensure and feeding him soft food herself. He looked at the Pasta Bolognese last night with the papardalle noodles and started eating away, even asking for seconds. My mom's eyes just kept getting bigger and bigger as he even rejected the spoon and used his fork to clean the plate twice. Mom said it was the first time he ate meat in several months. Then he had seconds of both the tiramisu and the yule log. Whatever happens next that is a nice memory. All the pilots here will appreciate my husband's surprise gift from the kids, courtesy of my son. A certificate for a ride in a P-51 Mustang. Pro life activists with gentle action at ACLU HQ. Die Hard: The Trump Twitter edition. Still giggling over this. Thanks, GUS. And recharge your powercells for 2019, for it looks to be a doozy. Drove from Lake Placid to Albany, turned in the rental and are on Amtrak back to Penn Station. here performed impromptu on request. Merry Christmas from a mostly lurker, sometimes commenter. This blog is the only one I follow regularly. There's a reason for that. Thanks, TM. Thanks commenters. The traditio? Sendingnew-borns home in hand-made Christmas stockings! Surber:We went to bed early, but soon out on the lawn there arose such a clatter, I sprang from my bed to see what was the matter. I tore open the shutters and threw up the sash. When what to my wondering eyes did appear, but a miniature sleigh and eight tiny reindeer. I shouted from the window, "Get. Off. My. Lawn." A Very Merry Christmas to All JOMers. Beasts, Caro, Buford Gooch--great to hear from all of you. The Roast, Yorkshire pudding, potatoes, onions, carrots, green beans are just about done. Time to rest the Roast, and open the wine. 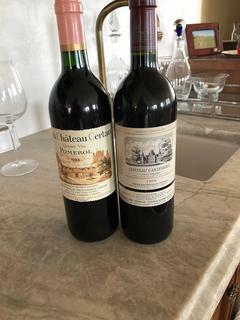 This year we have a nice 1993 Vieux Chateau Certan (BIL), and a 1998 Cantermerle (Mrs. JiB's maternal grandfather's). Here is to the POTUS, he ain't alone, we have his back. I will post an email from a USNA grad and ex-Navy fighter pilot, that I received. Tells it all. Someone asked where Cecil has been. I'm guessing he's hanging out with NK, Jeff, Rick, Alice H, and others who left this place in 2016. What I promised to post at 2:06. Catch a breath. 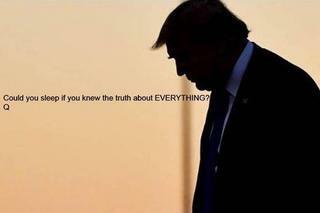 From a patriot. organization...he has kept his promise. "He's racist" "He hates Jews"
media. Have you ever asked yourself why? crime, and loss of livelihoods. I think she had an album on the Inner City label, which used to domestically release stuff from foreign labels like Enja before New Music Distribution released them as is. For people who want to make a gesture of support to the President but for whom TheTrumpWall is not a fit ... I notice there is an online petition linked at the GFM site. I haven't checked it out yet. Noted at a couple sites: "Another highlight to the day--Hillary is not President! Thank you for posting that. I feel the same way, except I wasn't anti-Trump in the beginning. I do hope the man feels the love from millions of Americans who are exceedingly grateful he took on this job. One thing I am convinced of is that the polls are wrong, probably intentionally. The site collecting money for the border wall has raised over $16 million. The anti-wall site has raised a little over $200,000. Thta's a huge discrepancy, especially given lefties LOVE to virtue-signal.